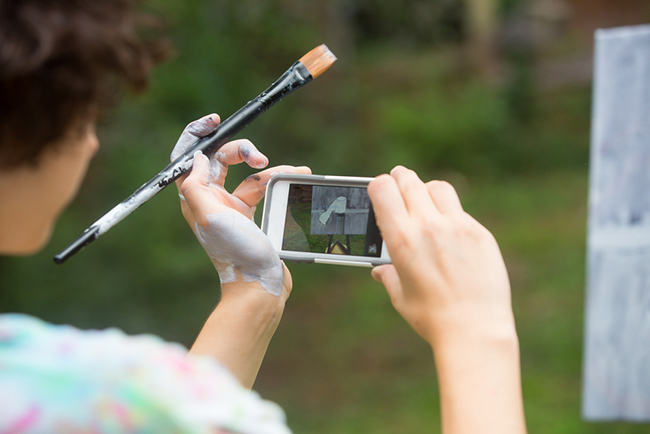 Don’t be fooled, Facebook Canvas has nothing to do with paint! Image via Shutterstock. Our phones have become our lifelines. We’re following presidential debates, registering for spin classes, answering work emails — heck, I’ve even been known to blog start-to-finish on my phone. And yet for all the time we spend on our mobile devices, there are a plethora of ways the mobile experience is lacking. One such example is a poor Facebook ad experience. If you’re a Facebook user (and come on, you likely are), you’ve experienced slow load times when clicking on ads — perhaps you’ve even closed out of a window before the landing page loaded. It makes me wonder: How many wasted dollars get spent on premature window closing? Clearly this was on the minds of Zuckerberg et al, too, as the folks at Facebook have recently addressed it with Facebook Canvas, a quick-loading new ad feature that allows marketers to effectively warm up prospects to their brand and offerings, thereby nudging them closer toward the conversion goal. Naturally, Facebook Canvas has marketers everywhere humming hallelujah. But is it worthy of all the hoopla? Whoa, whoa, Wayne and Garth – let’s dig in first before we decide. Image source. Why does Facebook Canvas matter to marketers? How can you can leverage Facebook Canvas for your or your client’s campaigns? 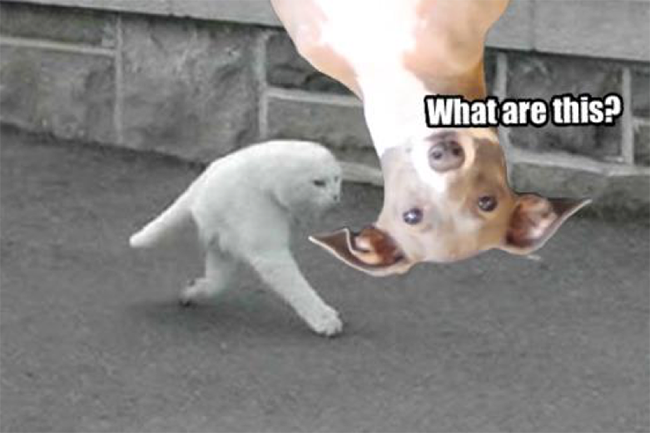 But seriously, what are this? Image source. Facebook has positioned Canvas as an “immersive and expressive experience on Facebook for businesses to tell their stories and showcase their products.” Confused? I was, too, so let’s go a little deeper. Facebook Canvas allows marketers to create a visually stunning storytelling experience where visitors can zoom in on images, swipe through image carousels and even tilt their mobile device to view panoramic images. 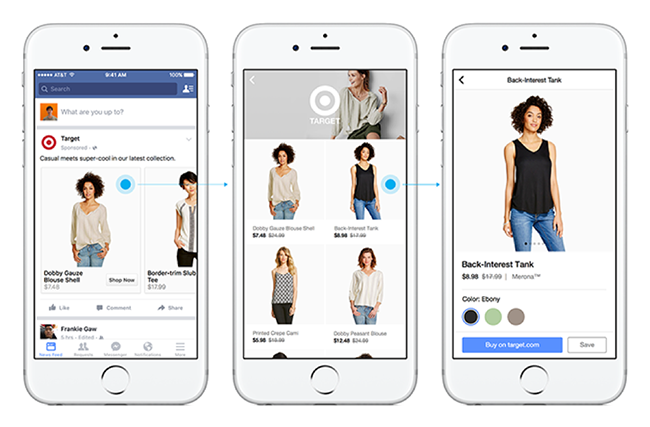 When you set up an ad using Facebook’s new feature, the visitor who clicks on the ad will instantaneously trigger the full-screen Canvas, right within the app. Oooo, it’s so fancy. Image source. The visual storytelling combined with the Speedy Gonzales load time is a surefire way to get your prospects primed to click on the Canvas CTA. But there are limitations to Canvas’ abilities. Firstly, it doesn’t offer lead capture functionality. And secondly, it’s only available for mobile, not desktop. So it’s not a replacement for landing pages, but rather a way to bolster your PPC efforts to get more conversions… but we’ll elaborate more on that later. Don't forget to optimize your mobile lead gen landing pages! 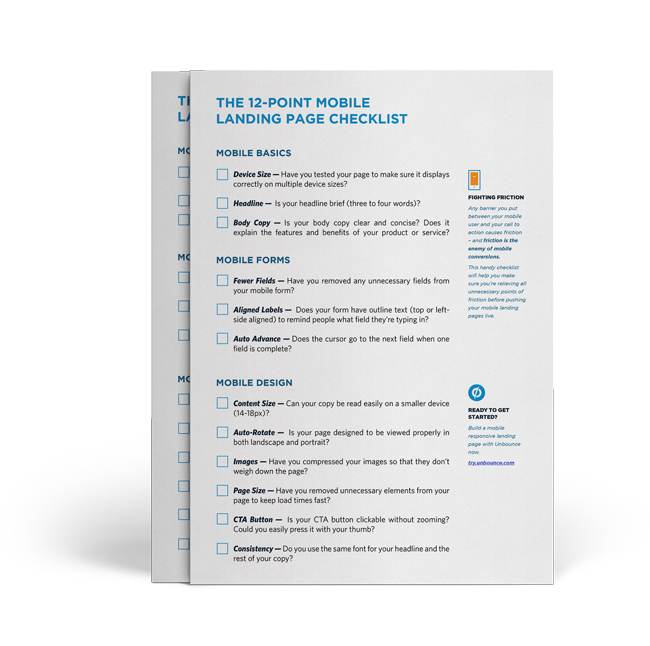 We put together a 12-Point Mobile Landing Page Checklist to keep you on track. For Facebook the benefits are clear: Canvas ads encourage users to leave the Facebook platform less frequently, thus allowing Facebook to accumulate more data. If only Brain had invented Facebook… Image source. Increased conversions. Standard Facebook ads trigger a new browser window when clicked, which can take several seconds to load, often leading to prospects x-ing out of the window. With this new format, the Canvas is triggered almost immediately upon prospects clicking the ad, meaning you connect with your audience quickly and effectively. Higher engagement. With Canvas’ advanced visual features (such as video, tilt-to-view panoramic images and image carousels) you can create an immersive storytelling experience for prospects. According to early testing results, Facebook reported that 53% of test subjects viewed at least half the ads (some of which are upwards of 70 seconds long). Ecommerce made easy. With Canvas you can add product catalogues and even “Buy now” CTAs to your ads, sending users directly to a check-out page. Pretty neat, right? So what now? The beauty of Facebook Canvas is its ability to really engage and connect with the audience’s emotions using storytelling. A fast food story is my favorite kind of story. Image source. 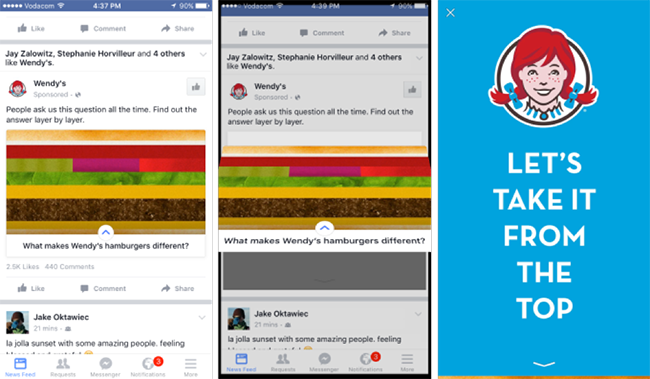 You’ll notice that the Wendy’s Facebook ad asks a question: What makes Wendy’s hamburgers different? And rather than simply answering the question (e.g., We use grade A beef, fresh produce, warm buns — ha, I said warm buns), Wendy’s shows their audience exactly what makes its burgers different, with mouthwatering images and playful copy. The Canvas even features a video of someone drawing with ketchup. How’s that for playing with your food? I’m more of a Burger King girl myself. It’s the square patties — they freak me out. Image source. 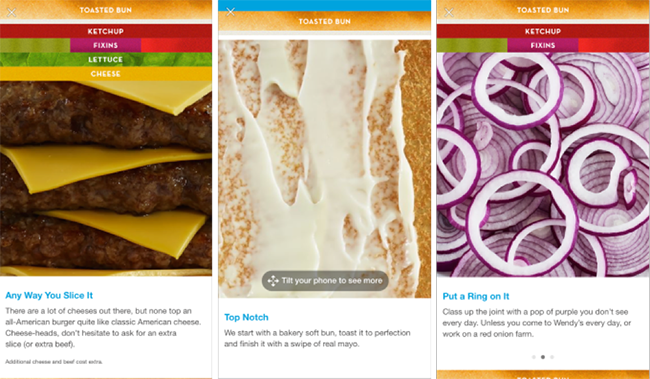 Canvas allows marketers to… wait, is that a triple cheeseburger? Canvas allows marketers trigger an emotional response in their audience using storytelling, which — when paired with a dedicated lead gen landing page — could result in conversion boosts. Ecommerce brands in particular can do a little happy dance knowing they can add product catalogues and CTAs to the Canvas, making in-app browsing a breeze. Everything up until the prospect actually keying in their credit card info can be done in Facebook. Image source. You’ll notice that all actions — from clicking on the ad to browsing the catalogue to viewing individual items — are done in the app, resulting in less friction and ultimately more sales. So does this mean you can stop using landing pages? If anything this highlights the importance of using Facebook Canvas alongside a dedicated landing page. Here’s the thing: what Canvas does really well is storytelling, which is really great for evoking emotion. If you’re successful in hitting your audience in the feels, they’re way more likely to engage in an exchange with your brand. But Facebook Canvas doesn’t offer lead capture, only a single call to action. Which is why pairing Canvas with a dedicated lead gen landing page is crucial. Don’t get your visitors all hyped up, only to drop the ball. Yes, it’s true, in cases of mobile ecommerce, you may be able to bypass the landing page in lieu of a well-crafted Canvas that leads to a checkout page. However, you’ll still need a dedicated landing page for all desktop visitors. Facebook Canvas is still in its infancy, and unless you’re a Power Editor user you need to request access to it, as it’s not enabled for everyone. Keep in mind that while these benefits have the potential to boost your brand awareness and sales, it’s important to test Facebook Canvas and then measure its impact. It may be an excellent addition to your marketing arsenal, but only by testing that for yourself can you know for sure.